This was day 2 of my fun Fall weekend in Connecticut (see day 1 here)! 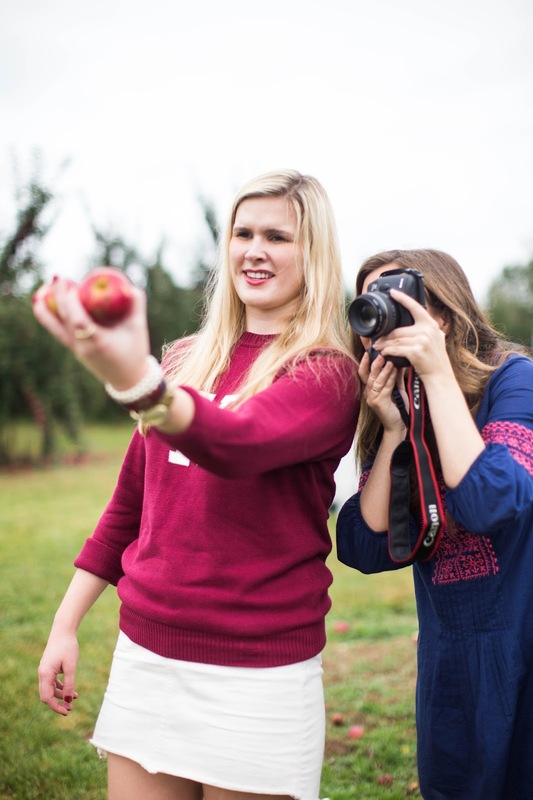 After spending some quality time with my roomies, I met up with all my blogger friends in Westport, CT and drove to Blue Jay Farm in Bethel. I'm telling y'all, this was the ultimate apple picking farm (and the most aesthetically pleasing). 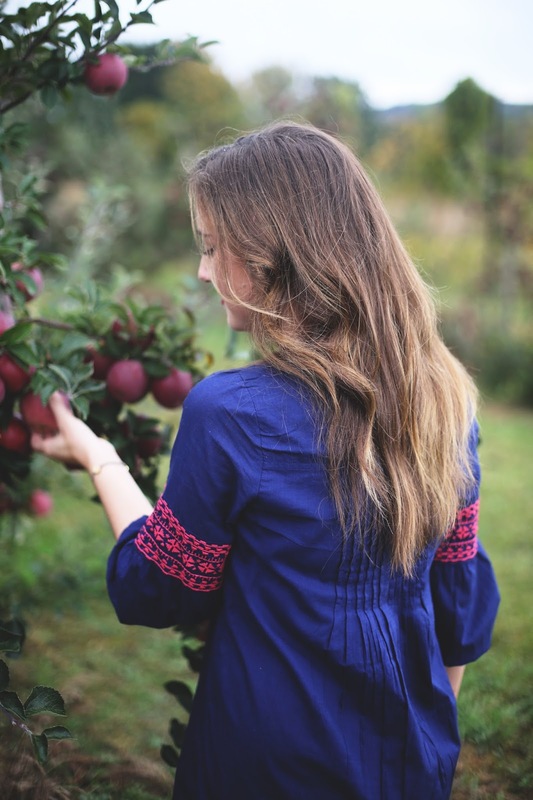 Instead of just an acre of dirt, the apple trees were embedded in luscious, green grass, well organized and spread out in very distinct rows that created lots of walking space. 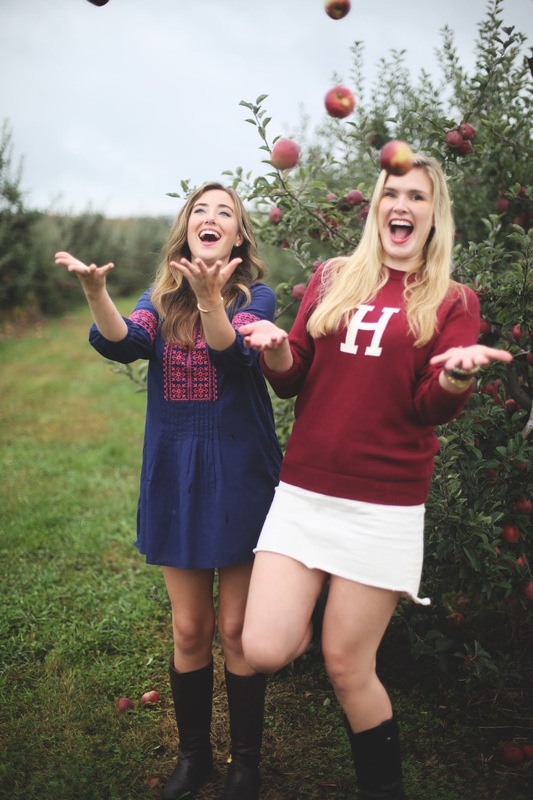 We had so much fun eating the apples and frolicking and we even troubled one of the workers for a group photo on his golf cart (don't worry, he didn't seem to mind haha). 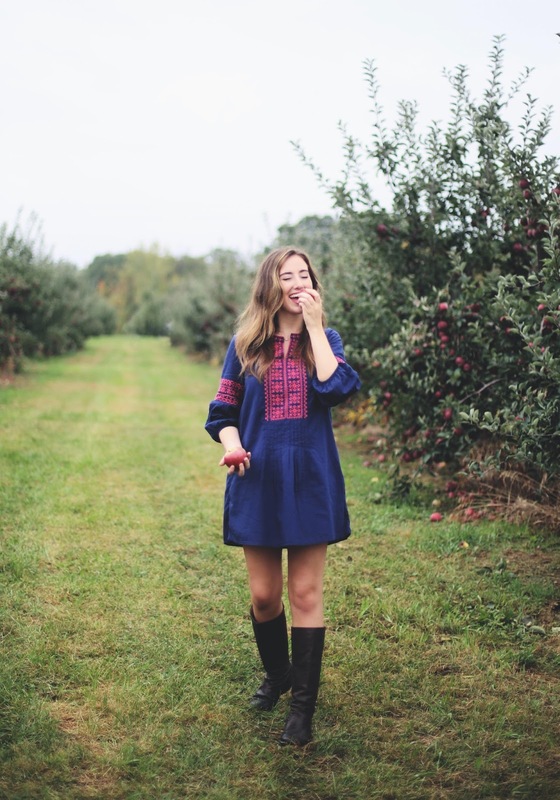 For this day, I wore this perfect-for-fall embroidered dress that Vineyard Vines sent me. I was actually supposed to wear it to the Victory Cup Polo match several weeks ago, but it was a scorching temperature of 90+ degrees that day. I didn't think I would fare too well in a dress meant for cooler weather. 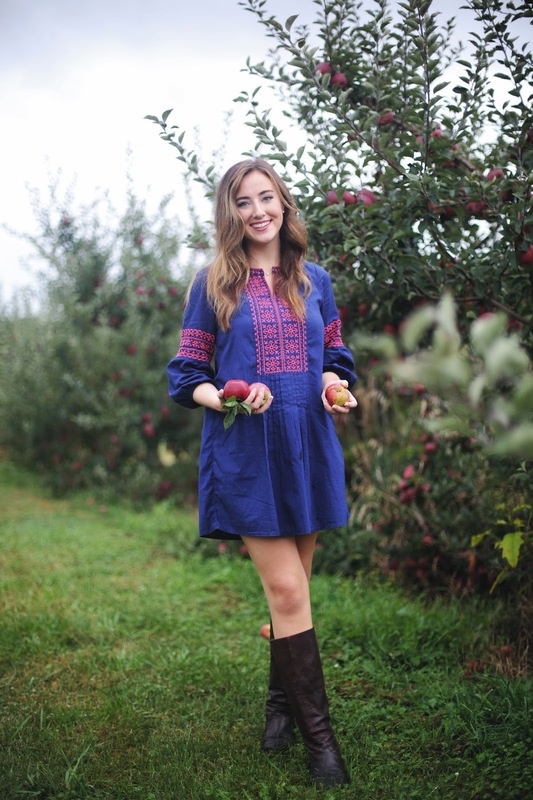 Thankfully, apple picking was an activity that I felt really captured the essence of this dress! 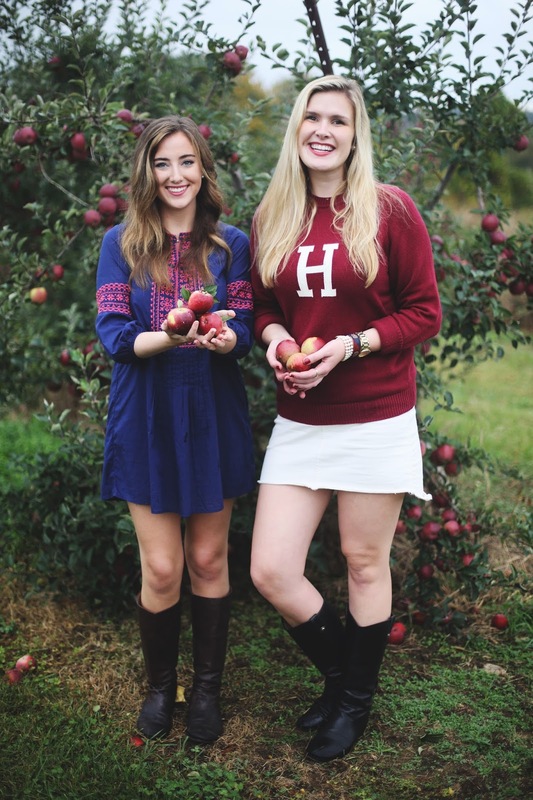 Vineyard Vines is known for its very preppy apparel, however, they've started selling more versatile and trendy pieces that I think a broader audience would appreciate. On another note, I feel like in most of my blog posts, I focus on sharing the absolute best, posed photos I get out of a photoshoot. I wanted to take a different approach in this post and incorporate some goofy, behind-the-scenes, realistic photos of our adventure because the reality of our day wasn't picture perfect at all, but still super fun! Even though the photos turned out really well it was actually pouring rain all morning before we got to the apple farm and was still drizzling when we got there. My hair does not do well in humidity, and even though I tried my best to keep it tame with loads of hairspray and a hairbrush, my hair was still pretty frizzy. Despite the fact that we were all SO hot and covered in an inch of sweat and rain, we still had the greatest time together! To sum it up, I just wanted to capture that in photos I shared here. Let me know your thoughts about incorporating a more "real" picture of my experiences in my blog posts. Is this something you want to see more of in the future? I love this dress. The embroidery is gorgeous. Thanks love!! it's such great quality, i love it!